Col. Randy Bresnik has come a long way since our first Citadel Space Star cadet-blogger Angelica McNerny met up with him on December 8, 2016 at Johnson Space Center in Houston where he was training for International Space Station Expedition 52/53. On that same day, while Cadet McNerny was with Col. Bresnik in Houston, one of the world’s most famous astronauts and the first American to orbit the Earth, John Glenn, passed away. Col. Bresnik was kind enough to share his thoughts about this American hero on videotape just a few minutes after he heard the news. It can be watched on Message 3 of the blog. On December 14, 2016, Bresnik met the nine million horsepower rocket that would propel him into space for his second trip to the ISS, the Soyuz MS735. He had already been training for this mission for more than a year, and in reality, for his entire career. In the months leading up to the launch, Bresnik, Paolo Nespoli of the European Space Agency, and Sergey Ryazanskiy of the Russian space agency underwent a barrage of high tech training exercises at Johnson Space Center and in Russia. It included emergency training in bulky oxygen masks, underwater spacewalk training in the world’s largest swimming pool (filled with over 6 million gallons of water! ), space suit and ship practical training and simulations, using zero gravity workout equipment, and much more. He took a couple of brief training breaks. One of them was to remote-in from Russia to The Citadel campus to join a panel of NASA colleagues speaking at our annual Principled Leadership Symposium. Then, in April of 2016, Bresnik paused his training to fly to the Baikonur Cosmodrome in Russia to wait as backup crew for Expedition 51. When that mission launched without a hitch, he got back to preparations for his upcoming command of Expedition 53. The dad of two, and devoted husband also broke for some well-deserved family time. Col. Bresnik and his crew finally lifted off on July 28, as the world watched them leave the Earth live on NASA TV, docking safety with the ISS to join the Expedition 52 already there. Then on September 1, Randy Bresnik became the first Marine to command the International Space Station. During Expedition 53 Bresnik took hundreds of breathtaking photographs of the Earth from the ISS, including photos of three massive hurricanes. He led three spacewalks, and advanced science by participating in experiments ranging from the study of cosmic ray particles, to fiber optics in microgravity, to synthetic bone repair, and even muscle atrophy in space mice. He also turned 50 years old, wished his daughter happy birthday from space, and sported a wardrobe of five different Citadel shirts on and off during the mission. 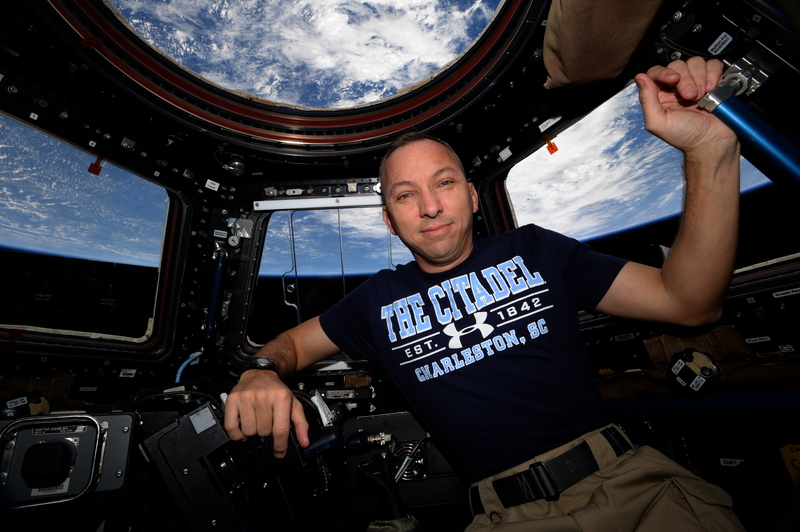 Additionally, he helped The Citadel STEM Center of Excellence by taking the time to speak to middle school students in the Charleston area, live from the space station. RG: What were your main takeaways from your time as commander of the ISS? CRB: Having the fortunate opportunity to serve as the Commander of the ISS only reinforced my belief that leadership is truly the art of getting things done through people. We were able to accomplish our mission on Expedition 53 because of the people we worked with and through, worldwide. Not only was there peer-to-peer leadership on a daily basis between crewmates, there was also leadership when working with the Mission Control Centers across the globe. There was also plenty of good followership necessary on our part with each other and especially with our control centers as we executed the plan of the day. RG: How did your experiences at The Citadel and in the Marine Corps affect your role as commander and how can you compare the three experiences? CRB: The Citadel established the foundation that the Marine Corps built upon that has me here serving as the Commander of the ISS. Without those two, I would not be here. The Citadel taught me that the only limits I had were the ones I placed on myself. The Marine Corps trained me and taught me that the sky is no limit, literally and figuratively. RG: How have your months in space shaped you and will you have any trouble re-acclimating to life on Earth? CRB: My time in space has only reminded me of how much I adore my wife and children. I am blessed beyond belief and can’t wait to see them again. Physically I will be challenged by gravity again, but we’ve been working hard every day up here with exercise countermeasures, so I anticipate that period of adjustment to be brief. The daily physical freedom to float and the joy in doing it will be missed, but that is ok. I’ve served my time and am being properly relieved. On December 13, there will be another change of command on the space station with Bresnik turning over leadership to the next astronaut in line. On December 14, Col. Bresnik returns to Earth with his colleagues Nespoli and Ryanzanskiy. 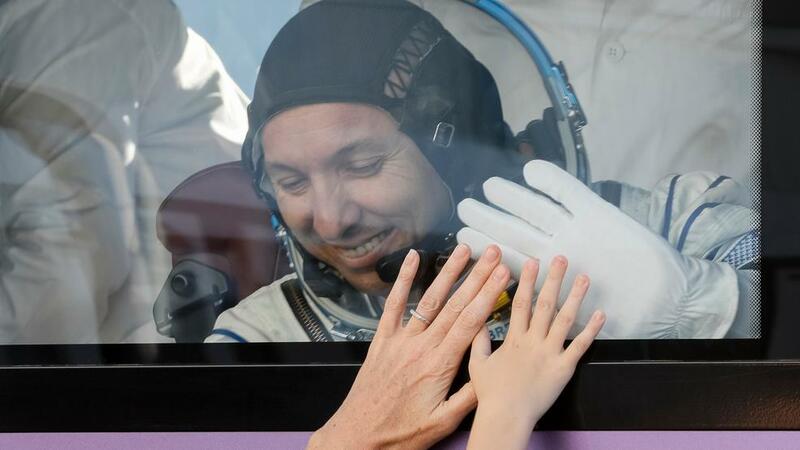 His trip home to Earth will take place a full year from the date he first touched the rocket that would get him to space. Godspeed, Col. Bresnik! We’ll be watching your return on NASA TV and look forward to celebrating your safe arrival.